Christmas Eve discovery in Caesarea excites archaeologists; beautiful sculpture was almost perfectly preserved. 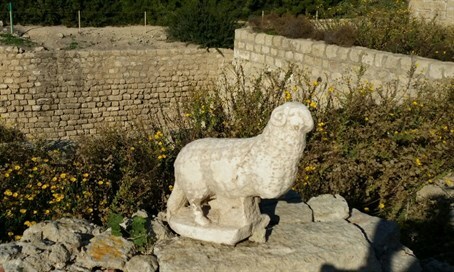 An impressive, nearly full-preserved ancient statue of a ram was discovered by archaeologists near an ancient church in Caesarea that dates to the Byzantine period. The discovery was made last Thursday morning in an archaeological excavation the Israel Antiquities Authority is conducting in the Caesarea Harbor National Park, at the initiative of the Caesarea Development Corporation. The use of a ram is commonplace in Christian imagery during from that period. In Christian art the ram is often depicted carried on the shoulders of the "Good Shepherd" (that is, Jesus, who is portrayed as the shepherd tending his flock), and sometimes the ram is situated to the left or right of Jesus. In Christianity the ram, like the lamb, represents the faithful, or Jesus himself, whose anguish and death were meant according to Christian belief to atone for original sin. Its usage dates back to the pre-Christian era; a ram appeared alongside the Greek gods Hermes and Mercury in Roman art, and it was a representation of the god Amun in Egyptian mythology. According to Dr. Peter Gendelman and Mohammad Hater, directors of the excavation on behalf of the Israel Antiquities Authority, "Caesarea never ceases to surprise as evidenced by this amazing statue that was discovered today. "In ancient Christianity Jesus was not portrayed as a person. Instead, symbols were used, one of which was the ram. "It may or may not be a coincidence, but the statue was uncovered on Christmas Eve. The statue that we found might have been part of the decoration of a Byzantine church from the sixth-seventh centuries CE at Caesarea. By the same token it could also be earlier, from the Roman period, and was incorporated in secondary use in the church structure."